What is a Traditional Herbal Registration (THR)? The traditional use of herbal medicines refers to the long historical use of these medicines. Their use is well established and the herb has been used in traditional remedies for over 30 years of which 15 years must be in the European community. 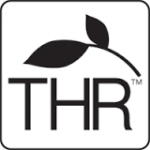 What is the benefit of using a THR? They make great self-care choices for conditions you can treat yourself and for your family, and many products contain natural ingredients. Modern herbal medicines are registered by the government regulator in the UK and other European Member States for a wide range of conditions that are suitable for self-medication. THR’s are acknowledged by the national authorities to be acceptably safe when used as intended. You can tell if a product is registered under the THR scheme by looking for the leaf symbol and THR certification mark on the product packaging. Active ingredients refer to ingredients of herbal medicines which are used to treat conditions. In herbal medicines where the active ingredients have been identified, the preparation of these medicines should be made standard to ensure they contain a specific amount of the active ingredient. Ashton & Parsons Infants’ Powders have been used for 150 years. Ashton & Parsons adheres to the Good Manufacturing Practice (GMP) where the manufacturing process is one of the key steps where quality control is required to ensure quality of medicinal products, including herbal medicines. Each sachet contains powder impregnated with 0.002ml of the active ingredient tincture of Matricaria which is extracted from German Chamomile flower heads. As with all medicines, herbal remedies should be kept out of sight and reach of babies and children. 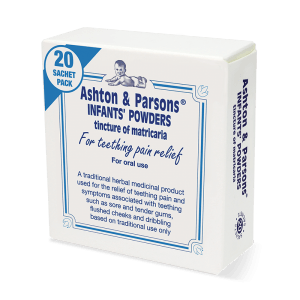 What is the active ingredient in Ashton & Parsons Infants’ Powders? Tincture of Matricaria which is extracted from the German chamomile flower. Does Ashton & Parsons Infants’ Powders contain any homeopathic ingredients eg Belladonna, Aconite, Pulsatilla etc? No, Ashton & Parsons is not a homeopathic product and does not contain any homeopathic ingredients. The only ingredient in A&P is active ingredient tincture of Matricaria in a lactose base. What is the difference between a THR and Homeopathy? Homeopathy is a Complementary or Alternative Medicine (CAM). This means that homeopathy is different in important ways from treatments that are part of conventional Western medicine. Practitioners believe that the more a substance is diluted in this way, the greater its power to treat symptoms. Many homeopathic remedies consist of substances that have been diluted many times in water. In some countries, there are no specific legal regulations concerning the use of homeopathy, while in others, licenses or degrees in conventional medicine from accredited universities are required. While the practice of homeopathy in the UK is not regulated by law, homeopathic products sold as remedies or medicines are regulated by the Medicines and Healthcare products Regulatory Agency (MHRA) https://www.gov.uk/government/organisations/medicines-and-healthcare-products-regulatory-agency. More detail about the differences can be found here http://www.rpharms.com/unsecure-support-resources/homeopathic-and-herbal-products-comparison-table.asp? Ashton & Parsons Teething Powders contains tincture of Matricaria, which is extracted from German Chamomile flower heads. 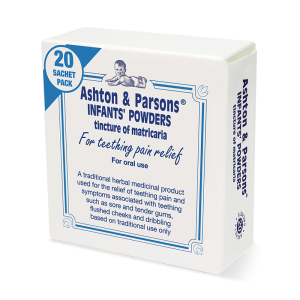 Tincture of Matricaria has traditionally been used in Ashton & Parsons Teething Powders to relieve the symptoms associated with teething pain such as sore and tender gums, flushed cheeks and dribbling. 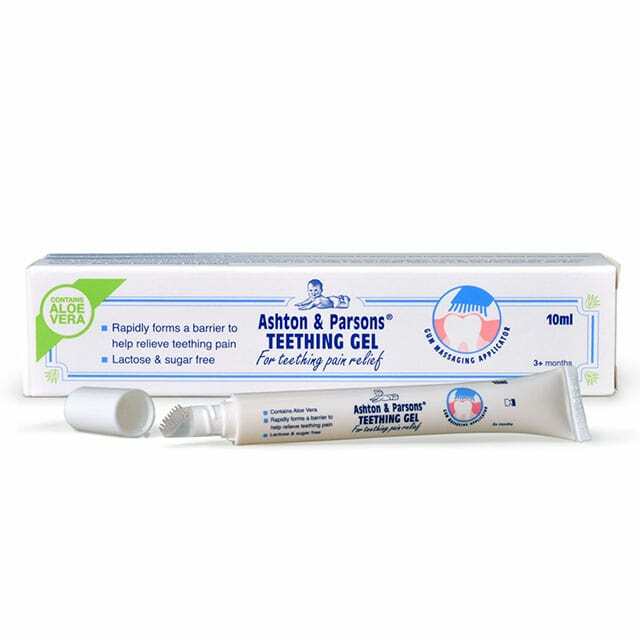 Ashton & Parsons Teething Powders are available in-store at several high street retailers including Boots, Tesco, Mothercare, ASDA, Superdrug and Sainsbury’s. You can also purchase online at Amazon, Tesco, Mothercare, Boots, Superdrug, Ocado, Lloyds Pharmacy and many other retailers. Click the icons below to buy online or find your local store. 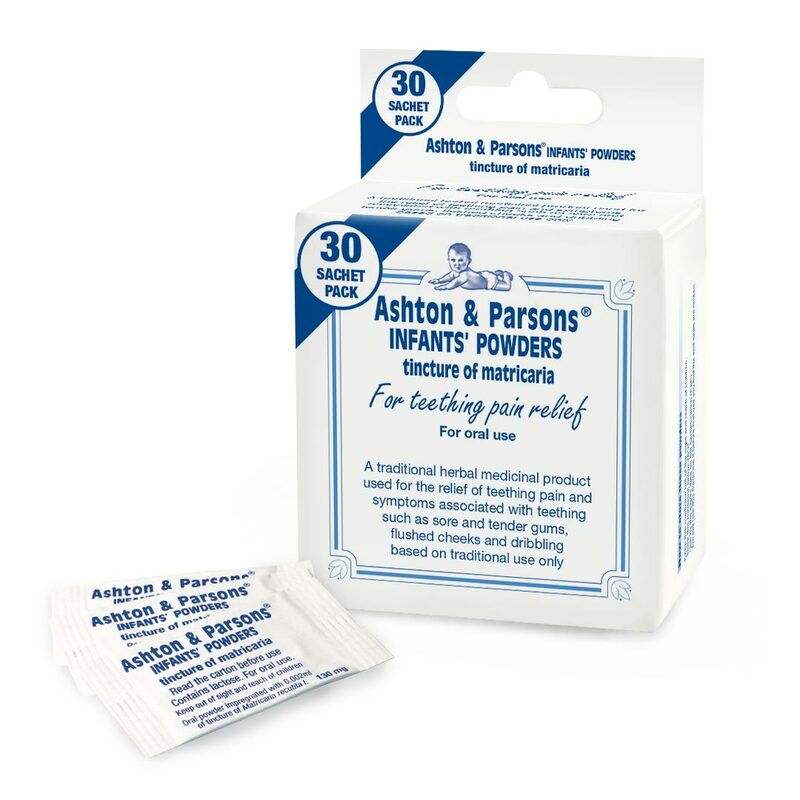 If you cannot find Ashton & Parsons in your local pharmacy check with the pharmacy assistant as they may have stocks behind the counter. If not they will be able to order some packs for you.